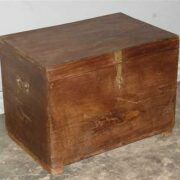 Vintage teak chest with robust metalwork . 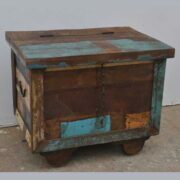 The closest thing you’ll find to a treasure chest, this trunk is a real delight. 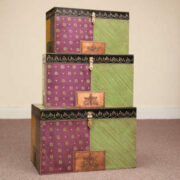 It is made of beautiful solid teak wood which has aged wonderfully and covered all over in robust metalwork. 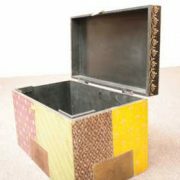 The lid of this trunk lifts upwards to reveal one internal compartment with generous storage and a chain to hold the open lid in place. The trunk also have a lockable metal clasp on the front.